(CNN) -- North Korea may be preparing for a new atomic bomb test a month after its last test, a U.S. official said Thursday. This screen grab from North Korean television on April 9 shows leader Kim Jong Il in Pyongyang. The official, who is not authorized to speak on the record, told CNN that Washington has "indications" that North Korea may be planning another test, which would be its third since 2006. The official would not provide any details, however. The possible preparations come as the U.N. Security Council debates whether to impose additional sanctions on the communist state in response to its May 25 test of a nuclear device, as well as several subsequent missile tests. Susan Rice, the U.S. ambassador to the United Nations, said Wednesday that North Korea "must pay a price" for its defiance of the international community, which has demanded Pyongyang halt those tests. In July 2008, U.S., Russian, Chinese, Japanese and South Korean negotiators reached an agreement with North Korea for it to resume the disablement of its nuclear facilities. But the deal has faltered over plans to allow the other parties to verify whether Pyongyang has revealed all of its nuclear secrets. North Korea has since threatened to restart its nuclear fuel plant at Yongbyon. Stephen Bosworth, the Obama administration's special representative for North Korea, told the Senate Foreign Relations Committee on Thursday that all parties -- including China, long North Korea's major ally -- have agreed to "coordinated steps" to get North Korea to reverse its recent moves away from the six-party agreement. "On our recent trip, we find that China shared a deep concern about North Korea's recent actions and a strong commitment to achieve denuclearization," Bosworth said. "Our challenge now is to work with China to turn that commitment into effective implementation of the U.N. Security Council resolutions." But Victor Cha, the former Asia director at the U.S. National Security Council, told the committee that additional sanctions could result in a new North Korean test. "When the Bush administration undertook some of these financial measures, many people argued it led to North Korea's first nuclear test," Cha said. "And the question arises whether these financial measures will then lead North Korea to their third nuclear test. And I don't think we know the answer to that." Earlier this month, the eldest son of North Korean leader Kim Jong Il, in a rare television interview, shed some light on who might eventually take over the secretive Communist nation. Kim Jong Nam told TV Asahi, a Japanese television network, in Macau that he does not care about politics or about succeeding his father. 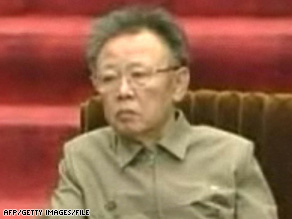 Kim Jong Il is widely reported to have suffered a stroke in August and has been absent from many public functions in recent months. In April, he named his son, Kim Jong Un, and brother-in-law, Jang Song Thaek, to the country's powerful National Defense Commission, suggesting his third son may be his heir. "I hear that news in the media," Kim Jong Nam said. "I think it's true ... however, it is my father's decision. So once he decides, we have to support him."